Not too sure why I haven’t updated about this project but better late than never. So I’m always on the look out for easy knitting projects, still no luck on learning how to crochet, and awhile back I discovered this great tutorial on knitted bows. Easy to follow and the results are great. If you haven’t followed M-S on facebook you should because sometimes we post projects we are working on without posting about them. The great thing about this tutorial is that you can be a beginner knitter and still be able to create this. I use whatever size needles I have. The bigger the size the bigger the bow. I mostly use a size 8 or size 5. These bows are great for anything really. I mostly use them for my hair, you can just slip them on a clip or a headband and that is that. No muss no fuss. (odd phrase) I even made one for mys sister’s cat Tomo. As you can see from the picture he wasn’t very happy wearing it…but how cute does he look? Dogs might be a bit more accepting but I doubt it. 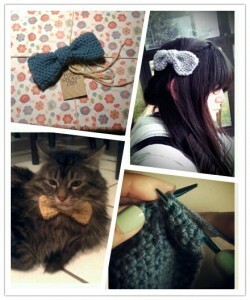 You can also decorate a gift with these bows. I think it adds something special to the gift. And I’m crap when it comes to gift wrapping. So adding a bow usually helps me out during the holidays. But for some reason I never store those paper bows correctly and they always come out torn or squished. Now I can just slip this on a ribbon and call it a day. You will get addicted after you make your first one. Fun and easy tutorial below. This Halloween my roomies and I decided to host a Halloween party. And I was in charge of costumes this year. Now I didn’t make full costumes. Mostly just accessories, we were on a budget this year. So I bought fabric for each of our costumes. 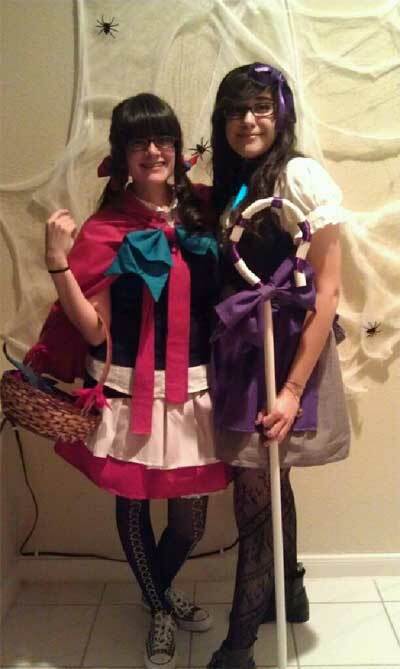 This year my sisters and I dressed as the non- princesses in the fairy tale world. 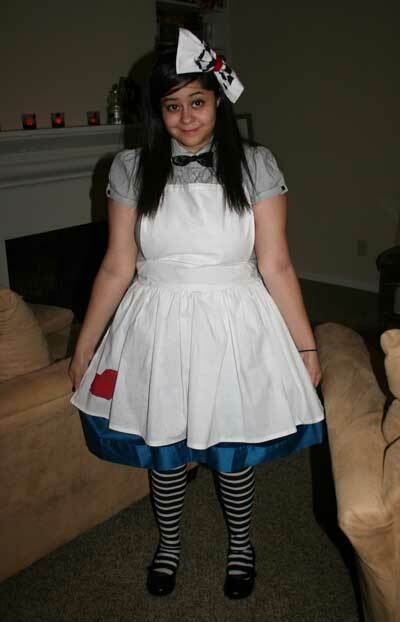 Mija went as Alice. Now for her costume I learned how to make these adorable Anime style bows from here. I used this tutorial to make her head bow and also the bow in the back. 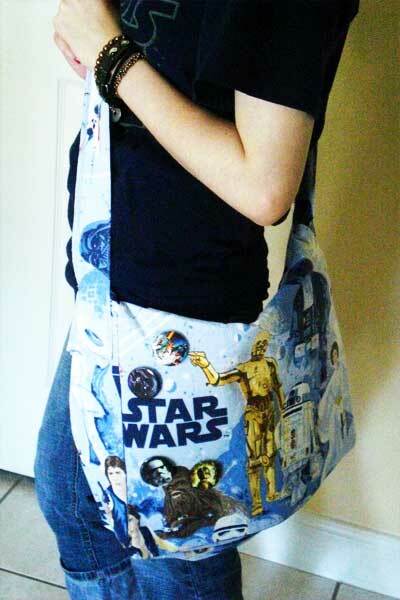 Unfortunately I don’t have any pictures of the back of the apron but it turned out so to be awesome. I also made her Alice apron, and I stitched a little red heart in the right side corner. Her skirt was actually a strapless dress that I bought from Taxi Taxi and I converted it into a skirt with an elastic band. I felt like the skirt really pulled the costume together and I’m glad I was able to make it work. And look how adorable she looks in it. I was Little Red Riding Hood. I made myself a cloak but only I didn’t even take any pictures with the hood up. >.< And I made myself a little skirt with a white apron attached to it. I also made the big teal bow, and the mini hair bows. I had a lot of fun making the costumes. Kat was Little Bo Peep. I only made her a purple apron and the purple bow for her shepherds staff. Jody did a terrific job on making the staff, it came out perfect. As for Jody’s costume, he bought most of the pieces. Since Mija was going as Alice we thought it would perfect if Jody went as the mad hatter. All I had to make was make a giant bow tie. I found the perfect fabric for a Mad Jody. 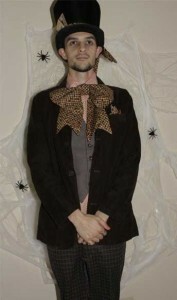 And he bought the rest of his costume at Taxi Taxi and substituted a magician’s hat for his mad hatter hat. I think every ones costume came out just amazing. And I had a lot fun learning new techniques. I hope I can top it next year. XD I hope everyone had a safe and Happy Halloween. I know I did.